Power of Words and Images — Students understand the strong influence of words and images in shaping their emotions, thoughts and actions. Dynamics of Discrimination — Students analyze the human dynamics of bias, exclusion and oppression and examine the consequences of social and political injustice by looking at contemporary and historical examples, particularly the Holocaust. Pursuit of Democracy and Diversity — Students seek multiple perspectives about concepts and events and apply those perspectives to a broader understanding of human rights and social justice issues throughout history. Personal Responsibility — Students recognize that individuals are responsible for the choices they make, and those choices can improve communication and relationships within their families, schools and communities. These learning objectives are advanced by the lessons and activities in this web site. 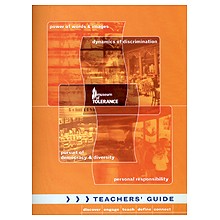 Download the entire Teacher's Guide. Download all Elementary School Activities. Download all Middle/High School Activities. These lessons support the California Reading-Language Arts and History-Social Science Frameworks and are aligned to the California Content Standards for English-Language Arts and History-Social Science, grades 3-12. Since the lessons support the content standards, most are appropriate for classroom use at any time. Specific suggestions are given for those that might best be introduced either before (pre-visit) or after (post-visit) the Museum visit. The Museum of Tolerance appreciates the assistance of the Division of Curriculum and Instructional Services, Los Angeles County Office of Education, in the development of these materials.